Fall is here and winter is fast approaching. The weather is getting colder and colder, and with it the ability to stay motivated to get outside for a run is sometimes waning. Perhaps like many of you reading this, I trained hard for many months for a full marathon in October. I completed the Leavenworth marathon on October 5th (you can see my full race report here), and that event was a culmination of training and the running season. Now, I am wondering what to do in the off season! Today, I wanted to provide a quick update on what I’ve done since the Leavenworth marathon over a month ago, and what some of running plans are for the next couple of months. I’ll be honest, when the marathon finished, I wanted to officially “retire” from running marathons ever again! I was happy to take a full week off from running to just recover. The second week, I did manage to get out a couple of times for an nice slow jog, but that was about it. After sitting around (basically) for a couple of weeks, I knew I wanted to get back into some sort of running routine, but didn’t know what (but definitely not a full marathon training program!). So, I did what anyone would do, I got my VO2max tested! You can see my reasons and results of the my VO2 max test right here. Lets just say I went into the test thinking it would confirm that I wasn’t cut out for distance running; but it turned out to show that I have a pretty decent VO2max of 61. But more importantly for me it showed me that I have several areas such as running gait, anaerobic threshold improvement, and heart rate recovery that could drastically improve my running times. So, instead of taking an “off season”, I decided to have a custom training program put together by Aaron at Therapeutic Associates. And what’s unique about this training program is that it has be running according to my heart rate, rather than pace. 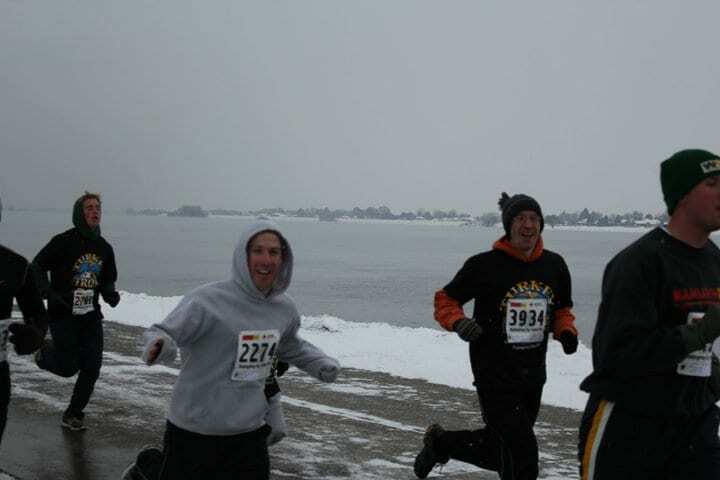 My brother and I at the Turkey Trot a few years ago – hope it doesn’t snow again! I know that come February or March next year, that I will be feeling motivated to run again – like everyone else at that time of year. So, I hope to keep in running shape and perhaps make some improvements. 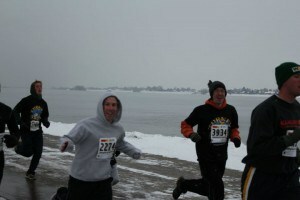 I plan on running a 5k Turkey Trot on Thanksgiving in a couple of weeks, and then a 10k race in mid December. And if you recall from my original goals this year, I still need to set a personal best in the 5k and 1 mile distances. So, the 5k will hopefully happen at the Turkey Trot, then I’ll just go run a mile sometime at a local track and hopefully get that one in the books as well! Since the distances I will be running through the end of the year are shorter, I will be doing much more speed work and strength training. And I have a 6 week custom training plan to help me out. This new plan that I’m following has me doing much more speed and hill workouts than I’ve ever done! Of course I’ve never actually trained specifically for a 5k or 10k so this should be different. In addition, I’ve been doing a lot more strength training than usual as well. And the fact that I’m now wearing a heart rate monitor and training in certain heart rate zones is really a change for me. I really do think its going to help me out quite a bit as I train my heart to operate effectively in certain zones and also to recover quickly. The speed and hill workouts should really help me improve my anaerobic threshold. In addition, the strength training should not only help with speed, but also injury prevention and potentially improved running form. So what are my goals for the 5k, 10k, and 1 mile? My current PR is 21:45, so I want to get under that! How much under that, I don’t know, but I think under 21:00 is realistic. The 10k is in December, so I’ll address that after I see how I do in the 5k. However, I would love to get under 44:00. The 1 mile is hard to predict. I haven’t run this distance (for time) in about 2 years. I think getting under 5:45 (my PR from high school) could be difficult. But we’ll see! Overall, I’m excited to be trying out a new training program that focuses more on speed and strength training. I can see that in a lot of ways this is really what I need. Training for a full-marathon prepared me well to run a lot of miles, but mostly at a very slow pace. This new program is using my heart rate ranges which is different than what I’ve done before. I’m finding that I am having to run faster paces during the first half of my workout, then I need to slow down as my heart rate increases during the second half. I’m finding it very interesting, and hopefully the training will help my heart rate recover quicker so I can sustain a faster pace than I could before. Anyway, just wanted to provide a quick update! I’d also love to hear how you are doing with your own training, so feel free to leave any comments or questions below!